The “Trees of North America” field guide states that about 40 types of birch trees grow native in the United States and Canada. Most birch trees exist in the cooler northern states and develop quickly when compared to many other kinds of trees. Birch trees often form pure stands of trees in a forest scenario but are somewhat short-lived. The birches share many features that will permit you to separate them from the other trees with which they grow. Compare the sizes of the birch trees. Some birches never grow very tall and are lucky to make it to 30 feet, like the water birch. Others are much larger in terms of their height, like the potentially 80-foot tall yellow birches and paper birches. Stand at a distance from a birch tree and consider the overall shape of the species. Looking at a typical river birch, you would observe that the trunk often splits into several separate stems, making for a tree with an irregular shape. Gray birch is a bushy type of birch, with its lower branches often almost touching the ground. Sweet birch has a more rounded crown of spreading branches. Study the bark of birch trees to get the best idea of which type of birch you have encountered. Of the North American trees, the birches have one of the greatest diversities in the bark from one type to another. Paper birch has a thin, white bark that will peel, or exfoliate, in long strips. Yellow birch has bronze colored bark that curls up in small strips on the tree. 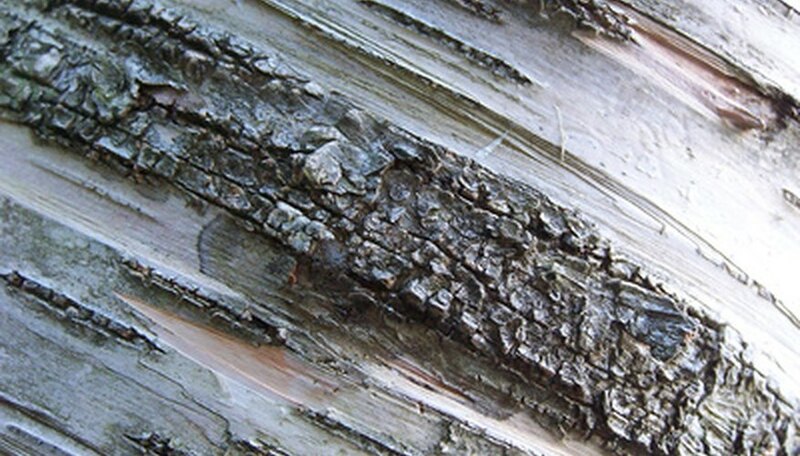 River birch has a scaly gray-black bark on older trees. Blueleaf birch has whitish bark that will not peel, but with a reddish tint to it. Look at the leaves of a birch tree. You will notice that all birches have alternate leaves, with each leaf on the twig growing by itself, with one leaf at each node. Birch leaves fall off every autumn and then grow back in spring. Birch leaves are typically oval or triangular, with a pointed end. Native birch trees have leaves that are different shades of green, with a large number of species such as the gray birch changing to a yellow color come autumn. Examine birch tree flowers. The male flowers usually develop during the late summer and remain on the tree through the winter. Those of a river birch, for instance, are 2 to 3 inches long and a reddish green color in the spring after hanging all winter long on the tree. The female flowers on a river birch are upright small 1/2-inch long green catkins that emerge from the ends of the branches. Once the female flower undergoes pollination, it changes into a cone-like structure that when ripe, falls to pieces, scattering birch seeds everywhere.